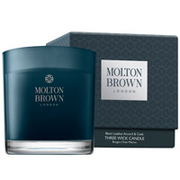 The Molton Brown Mulberry and Thyme Three Wick Candle will create an inviting atmosphere and infuse your home with a zesty fragrance. 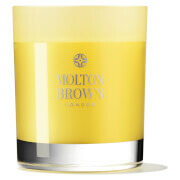 Combining notes of elemi, basil and thyme, the scented candle is presented in a hand-blown glass holder. - L.M. Top Notes: Aromatic Elemi, Basil. Heart Notes: Mimosa, Clary Sage, Rose Absolute. Base Notes: Crisp Maté, Thyme Absolute. Please be aware that products such as candles can only be shipped to the UK, France, Germany and Sweden due to Mail restrictions. To avoid delay to the processing of your overseas order, please do not add any such products to your basket for dispatch to other countries as we will be unable to fulfil your order.